Spray 5- to 6-quart slow cooker with cooking spray. In slow cooker, mix apples, butter and lemon juice. Sprinkle with brown sugar and cinnamon; toss to coat. Pour cider over apples. Cover; cook on Low heat setting 3 hours 30 minutes or until apples are tender. Granny Smith and Braeburn apples are two prime apple choices that hold their shape for long cooking. Your slow cooker is your secret weapon for the perfect seasonal side dish. These stewed apples are super versatile, so don’t hesitate to make them every weekend in the fall! With only two steps to prepare, this recipe is a great way to use up extra apples. Top your pancakes at breakfast or serve them alongside your favorite ice cream for dessert. Apples that hold their shape when baked, like Granny Smiths and Braeburns, work well in this recipe. 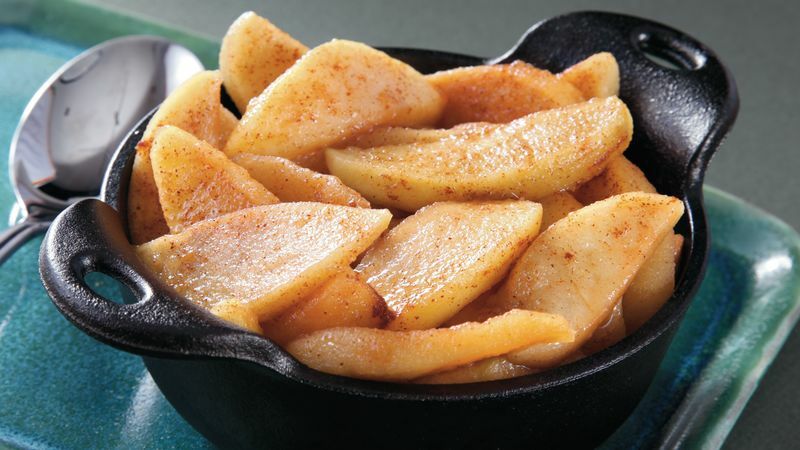 Check out Betty’s best apple tips for more expert advice on cooking apples. And since you’re here checking out a quintessential apple dish, we’re sure you’ll love the rest of Betty’s apple recipes, too.